Can’t afford central heating? Or maybe you just prefer heating rooms individually. If so, you might want to look into space heaters. Normally, buying a heater for the living room or a study can be easy. However, a garage is an entirely different type of room to heat. With that in mind, you would want a good list of best garage space heaters, so that you can choose the best model for yourself. Before you answer that question, you’ll need to know what space heaters are on the market right now. You’ll also need to know of the various types of heaters, what size and shape work best for you, etc. These space heaters are powered, as their name suggests, by electricity. They further split into three more categories: convection heaters, infrared heaters, and heat pumps. Convection heaters pass electricity through a particular heating element, making it hot. These elements are usually made from metal or ceramic. The process that makes them hot is called Joule heating. Said heat of the element is then distributed through the air by means of convection. Infrared heaters work in a similar fashion, passing electricity through a conductive wire. However, the bulk of the heat is transferred by radiant heating, not convection. Hot wires in the heater emit infrared rays, and they, in turn, reach your clothing or skin directly instead of heating the air around them. Heat pumps are kind of like refrigerators and air conditioners, except they use the exact opposite process which produces heat. A heat pump would move the heat from outside of a room to its inside, warming it. When it comes to burnable fuels for heat, combustion space heaters split into categories according to what they burn off. Among these are space heaters that use natural gas, kerosene, propane, or even wood and coal. The matter of choosing the right space heater for your garage is simple. Like with all rooms, a garage will vary in size. And the bigger the room, the slower it will take to heat up. Next, there are safety issues – after all, you don’t want anything to combust where your car is. Here is a handy list of things to pay attention to while looking for the best garage space heaters. If your garage is small, buying a heater that’s too small will make it too hot to work. Consequently, if your heater is too small, the large garage will not heat fast nor efficiently enough. The best thing to do is to measure up your garage and pick a heater accordingly. The height of the garage also plays a role in picking a heater. If your garage is 6 or 7 feet high, you should choose a more powerful heater. Or, alternatively, choose a fan-forced heater or even wall-mounted ventilation ducts. Placing the heater in the right place will also help heat up the room. If you want mobility, a free-standing heater is for you. You can move them about anywhere – under the table, on the workbench, next to the door, anywhere. With this mobility, you can heat up any part of the garage at any point, which would make free-standing heaters a good choice for best garage space heaters. However, they do take up space, unlike less moving, yet more space-saving wall-mounted heaters. Garage heaters, in general, come with one of three power sources: propane, natural gas, and electricity. With propane and gas heaters, their main benefit is that they’re very economical. They heat up large rooms very quickly and save a lot of money in the process. However, there are issues you need to consider before buying a propane or a gas heater. The combustion material they use is dangerous, and when you use them in an enclosed space, you must take extra care not to damage them. On top of that, you’ll have to take care of them and check them regularly for damages or leaks. When discussing the best garage space heaters, a vast majority will choose natural gas-powered ones. But before you buy one, you’ll have to install gas lines, as well as venting systems to vent out the potentially toxic fumes. That can be rather expensive, yes, but you’ll get your money back with a high-quality heater that doesn’t waste energy. There are two types of gas heaters: radiant or infrared heaters and fan-forced heaters. Both burn natural gas, but they warm up space differently. These heaters contain a fan which draws in cold air. A powerful element within the heater then warms the air, which goes back into the room via the same fan. These types of heaters are best for very roomy, large garages. These heaters are usually mounted in one position, so you’d have to stay relatively close to them while working (though there are freestanding, portable versions as well). However, they generate heat really quickly, and as such are the best for smaller, more compact garages. An electric heater has many options that a gas one does not. For instance, they have an automatic turn-off switch or a sensor. If you happen to knock one down by accident, it turns itself off so that you receive no damage. Each one of them has various settings, so you can adjust the level and the output of heat. Their main flaw is that they’re not well suited for large areas, so if you have a smaller garage, the best garage space heaters for it will be electric. When you see “best garage space heaters when it comes to capacity,” think of BTU (British Thermal Unit) that they generate. Any smaller heater will generate anywhere between 4.000 to 9.000 BTU. That is enough for a garage that’s up to and including 250 sq. ft. If your garage is double that size, think of a 25.000 BTU heater, and if it’s double that size or 1.000 sq. ft., go with a garage heater that produces anywhere from 30.000 to 60.000 BTU. Another important detail would be the wattage. Roughly 2.500 to 5.000 watts of power will be enough for a medium-sized garage of 500 sq. ft. With bigger garages, of course, you will go for bigger wattage. It is of vital importance that your safety isn’t compromised with your new heater. For example, the heater’s hot surface can burn you, so you should look for heaters that have a cool-touch surface or a temperature-resistant wire guard. Heaters overheat. And an overheated heater breaks down, or worse. So the best garage space heaters you can find ought to have some kind of overheating protection. Normally that would be an automated shut-down system or a kind of safety switch. These two will make your heater shut down and cool off for a bit. And speaking of switches, a good way to go is to pick a heater that has a tip-over switch. Working around the garage, you’re likely to tip the heater over at some point. Therefore, a tip-over switch helps by turning the heater off the minute it hits the ground. As is the case with everything, you need to buy a product that will pay off. Buying an overpriced heater that doesn’t work in your favor will be wasteful. On the other hand, if you buy a cheaper heater simply because it’s cheap, you can end up with a faulty, useless, or even a dangerous product. The best thing to do here is to take everything else into consideration – size, position, type of heating, etc. – and then compare leading brands. That way, you’ll get the best possible heater and save money in the process. You’ve seen some of the safety features that you should look out for. But the best garage space heaters can come with a variety of other features that make them stand out from the rest. First off, you might try to find a heater with a thermostat. With it, you can set up the temperature easily and work in peace until you finish. Multiple output heaters will even conserve energy, so you’ll waste less using them. Next, try picking out a heater with a timer. If you set the time for the heater to work, the minute that time’s up, it shuts down. That way you won’t worry about having to do it manually. It’s safe and useful. Another feature you should pay attention to is the length of the power cord. Make sure it’s at least 70 inches long and do not use extension cords. Aside from safety, long cords also allow for more mobility of the heater. With smaller heaters, think of getting one with a remote. Remotes can help you decrease the heat output or shut the heater down from a distance. Most small heaters require you to bend over and do the deed manually, so a remote will be a lifesaver. Finally, pick a heater with a good handle. You’ll be carrying it around quite a bit, so a handle will provide more mobility and less hassle. If you’re looking for a decent propane-powered garage heater, Modine HD45 will work for you. It’s powerful, simple to install, easy to maintain, and works perfectly. Modine’s HD series has already given customers a wide range of decent products, and HD45 is no different. The key feature of HD45 is silence. In other words, while it’s heating your garage, it produces almost no sound. Plenty of other heaters out there either hum or howl, but not HD45. Considering how stressful working in a garage can be, a silent heater is always a bonus. Design-wise, the Modine HD45 is small and compact. You can carry it easily, and it doesn’t take up too much room. It is 26 inches long, 12 inches wide and 16.5 inches high. In terms of weight, it doesn’t go over 60 pounds. 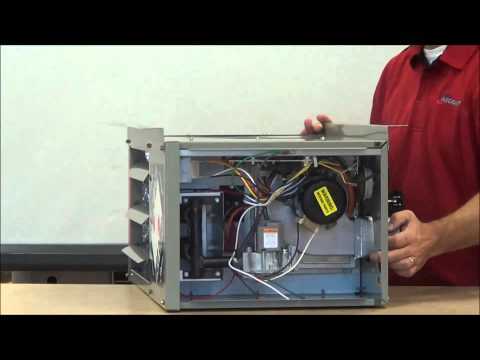 Modine HD45 is therefore compact, in every sense of the word. Modine HD45 rightfully earns its place among the best garage space heaters. Probably the best way to describe it would be “small and silent.” However, its size and quiet work output are merely two of many benefits the heater offers. In terms of power, Modine HD45 was tailor-made for large garages. Its voltage reaches 115V, which is quite the number for a small heater such as this one. But it’s the BTU where it really shines. Modine HD45’s BTU input is 45.000, with the output reaching 36.000. While this works for large garages, you can also use it in a mid-sized garage, as small as 350 sq. ft.
Another major feature is its design. The dim-gray color, while not attractive, makes it perfect for blending into a garage environment. You can install it either with right-hand or left-hand piping by simply flipping it over. As such, it can receive propane or natural gas from any side. However, it does come with its set of flaws. The Modine HD45 doesn’t come with batteries, which you would need to purchase. Another potential flaw is that this heater wouldn’t be good for small garages. If you have a single-car garage, it might be a better idea to find a different heater. Yet another small, but powerful heater. One thing you can clearly see about Fahrenheat FUH54 is that it’s both portable AND mountable. In other words, you can either affix it to one place in your garage or keep it as it is and move it from place to place whenever you need to. Couple that with amazing performance, large wattage, and the emphasis on safety, it’s an absolute candidate for the best garage space heaters of 2018. Quite smaller than the Modine HD45, the FUH54 measures 18 x 14 x 13 in. It even weighs less than half of what HD45 does, at 24 lbs. To anyone looking for a compact heater, this can only be a plus. Design-wise, it also comes in one color, so it’ll blend in with any environment. That, of course, includes garages. But unlike Modine HD45, the Fahrenheat FUH54 is an electric heater. That means that it has all of the benefits as well as flaws that every electric heater has. More on that below. You’ve seen how small and compact the FUH54 is. However, the portable-mountable feature makes it a must-have tool in your garage. In terms of power, though, it has some drawbacks. While it offers 5.000 watts of power, covering 500 sq. ft. areas with heat easily, it only has a little over 17.000 BTU. Nevertheless, your moderate-size garage will receive all of the heat it needs from this little heater. Safety is a major feature of FUH54, and it fully justifies its spot among the best garage space heaters. Dial heater controls allow you to change the heat from 45 degrees to 136 degrees Fahrenheit. However, you would still need to purchase an external thermostat for a better performance. The high-level cut-out option helps the FUH54 with overheating. In other words, it switches the heater off the moment it becomes too hot to work. One major setback of Fahrenheat FUH54 is that you can’t simply plug it in and use it. The heater has to be hard-wired to work, and you can’t exactly install that yourself. That means you’d have to spend a few extra dollars on an electrician. The very second you see that bright red color, you know you’re getting a Dr. Infrared product, which usually means high-quality heating. This industrial, portable electric heater works wonders both inside and outside, making it perfect for sheds, workshops, and garages in particular. All of this is impressive, as it is far smaller than both Modine HD45 and Fahrenheat FUH54. Its dimensions are 12 x 12 x 15 inches, and it weighs an incredible 12 pounds! With its steel casing, it’s also exceptionally safe. One other thing you might notice with DR-988 is the fan. The combination of electricity and fanning gives this heater the ability to cover 600 sq. ft. of space, more than enough for a medium-sized garage. So, to sum up – bright-red, electric, portable, fan-driven, small, lightweight, and durable. That sounds about right for Dr. Infrared DR-988 and is more than enough to place it among the best garage space heaters of the current year. Dr. Infrared DR-988 can cover an area of 600 sq. ft. with a power of 5.000 watts. In addition, you can use it both inside and outside equally well. However, the BTU output of a little over 19.000 places it only a bit above average. But even with a smaller BTU, this heater will do its job, and it will do it silently, at only 45 dB of noise. The maximum heat the DR-988 puts out is 93 degrees Fahrenheit. However, you can set your own level of heat with the thermostat. Moreover, you can set up how long the heater will work using the automatic shut-off system. DR-988 is very portable, however, it’s not a heater if you’re looking for something to mount, you’re better off using a different heater. The handle on top of its casing allows for easier movement, as you can carry it with you all over your garage. The biggest flaw of DR-988, though, is that it’s almost entirely manual. You have no remote to control it from a distance, so you have to approach it to change the settings. In addition, this heater HAS to be unplugged manually after use, even with the automatic shut-off system. And here you have another small, lightweight, and reddish heater. But unlike Dr. Infrared DR-988, Mr. Heater F232000 is a gas heater. With its single-pound propane gas cylinder, this little wonder can heat up 18.000 BTU. And, unlike the previous heaters in the text, the F232000 is specifically tailor-made for small garages. If this device has anything that puts it on the best garage space heaters’ list, it’s the very sleek, stylish design. A beautiful mixture of red and black encases the heat-making core, as does the black high-temperature wire guard. It just looks beautiful, like a modern suitcase. The handle on top of it only confirms this claim. But looks aren’t everything. The F232000 is portable, so you can place it anywhere you want. Be it next to your legs, on your workbench, or under your chair, it will fit snugly and keep you warm. While not the smallest on this list, it still is small, with its dimensions being 9 x 14.2 x 14.4 inches. Weight-wise, it’s the lightest, at a little over 9 pounds. As stated above, Mr. Heater F232000 is very small, yet very powerful. If you need less heat, though, you can set it up easily. The heater has two standard heat settings, low and high. So if you don’t want to sweat or feel stuffy within your small garage, just shift to a lower setting. It’s that simple. F232000 is a propane gas heater. Just like most gas-powered heaters, it’s economical and saves money, making it a better choice than electric heaters. It’s also economical with its size and portability. Merely fold down the handle, and you can store it away under a table, for instance. The external casing of F232000 is ceramic. This both helps with heating and gives the device a sturdy, durable outer shell. In other words, you’re buying both a great, quick heater and a safe device. And speaking of safety, the automatic shut-off system here works like a charm. When you’re not using the heater, it switches off by itself. However, even with this automatic shut-off option, the F232000 has the reputation of catching fire if you don’t maintain it. In fact, it’s a common complaint from its users. But a larger flaw would probably be that this Mr. Heater model is made solely for small garages. Even if your garage is medium in size, F232000 will not be enough to heat it. This alone makes it shine less among the best garage space heaters of 2018. While DR966 isn’t lighter than the other heaters on this list, it is roughly the same in size. At 14.5 x 14.5 x 13 inches and 27 pounds, however, you can’t really call it “heavy,” either. Naturally, Dr. Heater DR966 has more features to it than size and weight alone. This model is a full-metal, heavy duty electric infrared heater. Its wattage and BTU alone make it perfect for outside areas, garages included. You can plug it directly into your electrical socket, which immediately makes it better than most other electrical heaters on the market. You will not save a whole lot of energy, but you’ll entirely avoid any potential toxic fumes emissions that gas or propane-powered heaters are infamous for. All of those features are more than enough to place DR966 among the best garage space heaters of 2018. But it has a lot more to offer. If you have a large, open garage, Dr. Heater DR966 will cover it entirely. After all, it runs on 6.000 watts of power. When its manufacturers say “heavy duty,” they indeed mean “heavy duty.” The all-metal casing and metal parts support this claim further. Naturally, the heater offers more than sturdiness and power. You can use its thermostat to set up the intensity of heat. Need lower heating? You can get it with a flick of the switch. In addition, this model has five louvers that it can use to direct the flow of air. Of course, an all-metal casing can lead to overheating. But Dr. Heater DR966 has you covered with an automatic shut-off system. The moment this heater reaches its top temperature, it switches itself off. Safety is important, and with this model, you won’t have to worry about it. However, you might have to worry about other issues. Unlike other products here, Dr. Heater DR966 is manufactured in China. That means that there’s a higher chance of it breaking down sooner than its short, one-year warranty can cover. Another potential reason to avoid this heater is that it’s not too good in closed, smaller spaces. On top of that, you have to do everything with it manually, since it doesn’t have a remote control. Another Fahrenheat, and another ceiling-mount portable-mountable hybrid. Much like the other heater from the same manufacturer on this list, Fahrenheat FUH724 is durable, lightweight, and powerful. The key difference is BTU – FUH724 has one of 25.600! That’s a lot, and if you’re looking to heat up a garage, that’s perfect. How large of an area can it cover? Taking its wattage and BTU into consideration, FUH724 can heat up 1300 sq. ft. easily and quickly. Not to mention that it will heat the entirety of that area consistently and evenly. On top of that, it’s an electric heater, so once again you won’t have to worry about toxic emissions that propane or gas heaters have. In terms of durability, one look at its epoxy paint coating tells you everything. FUH724 is one sturdy heater and will endure corrosion and rust well. Looking at that ceiling mount, you can see the biggest asset of Fahrenheat FUH724. Any heater that can both be mounted on the wall or taken around the garage easily deserves to be on the list of the best garage space heaters. Of course, the heater’s amazing wattage and BTU output confirm this claim. But Fahrenheat offers a lot more than that. In terms of safety, the epoxy coating isn’t the only feature of FUH724. This heater, unlike others on this list, has both an automatic shut-off feature AND an automatic turn-on feature. What does that mean? Well, when FUH724 reaches its top temperature, it shuts off. However, the moment it cools down, it resumes working automatically. You’ll have no need to turn it back on again manually. But Fahrenheat FUH724 isn’t perfect. Setting it up will take time, mainly because the instructions look dreadful. At times, you’ll even read a step that makes no sense in setting the heater up. The other major flaw revolves around the heater’s price and cost-effectiveness. You’ll pay far more for it than other heaters on this list, and it’s known to waste quite a bit of power when you use it. For that reason alone, you might reconsider buying a different heater. The answer to this question depends on what you need the heater for. If you have a small garage, then F232000 is your ideal choice. The problem with that model is that it absolutely cannot work with medium and large garages. For the largest areas, you ought to go for FUH724 or DR966. The remaining three models will satisfy any medium-size garage owner. Both combustion and electric heaters have their flaws, of course. In this regard, it really comes down to what works best for you. You ought to remember, though, that gas heaters require an additional setup like installing a gas line. On the other hand, electrical heaters will often waste power from your home directly. But what of these six models? The best choice for you, out of the models in this text, is Modine HD45. Even if you have a smaller garage, you can make this heater work for you. It’s easy to set up, durable, small, and efficient. Of course, it costs more than nearly all other models in this text, but you will get your money’s worth with Modine HD45. It is the best garage space heater of 2018. There are many factors you have to take into account when looking for the best garage space heaters. Size, power, type, set-up, and safety play a major role in picking the right heater. Within this list, you will find six models that have performed best in 2018. You can buy all of them at online retail stores like Amazon, as well as directly from their company websites. Get your perfect space heater today, and enjoy the new warmth of your garage. Size, power, type, set-up, and safety play a major role in picking the right heater. Within this list, you will find six models that have performed best in 2018.